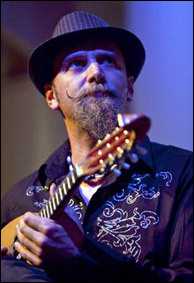 Carlo Aonzo will lead his 12th Annual Mandolin Orchestra Workshop March 29 - April 1, 2012 in New York City. Carlo Aonzo knows a lot about painting, cuisine, the sartorial arts, and how to grow a truly majestic Van Dyke. He can pilot a Vespa at high speed over the cobblestone streets of his hometown of Savona, Italy like Ayrton Senna at Monaco (American translation: like Jimmy Johnson at Talladega). He's a real old-school Italian gentleman, with a puckish sense of humor and a genial personality. You might have heard, he also plays mandolin a little. When I was first getting serious about the classical mandolin, I played his Mel Bay VHS tape (which he made after winning the Winfield Mandolin Competition in 1997) so much I wore out the heads, and had to buy a second copy. It was my first real immersion into the Italian repertoire, and I couldn't believe that so much could be done on a single solo mandolin. I had already been up and down the Sonatas and Partitas, and had shifted some violin and guitar repertoire to the mandolin, but here was real, virtuoso mandolin playing, to compete with the like of any instrument. For a kid from Queens, this was like hearing the aliens playing John Williams in Close Encounters of the Third Kind: I knew the tune, but I ain't never heard it played like that. Barry Mitterhoff was kind enough to introduce us, and I endeavored to soak up as much as I could from him. And not just about the technique of the instrument, but also the history, the tradition, and the world of musical possibilities the mandolin could provide. And he couldn't have been a more accommodating teacher. This is, of course, not always true of the great players. Education remains a focus of his career, both in Italy and around the world, so with his 2012 Manhattan Workshop approaching, we sat down to talk about his career and his passion for pedagogy. Carlo Aonzo with Elena Buttiero playing Capriccio Spagnuolo op. 276, from his recording Fantasia Poetica, 2010. Joseph Brent: Ciao Carlo, it's great to have a chance to speak with you! Carlo Aonzo: Grazie Joe! It's my pleasure to speak about mandolin, always! Joseph Brent: Likewise! You are of course familiar to many readers of the Mandolin Cafe, but for those who aren't, would you mind telling us a little about your background? Carlo Aonzo: I've been playing mandolin since I was a child. The mandolin is a tradition in my family and my father taught me. I got from him the love and passion for this instrument and he was a link to the roots of its tradition. I got my degree at the Conservatorium in Padova with Ugo Orlandi - a scientist of the instrument, with a knowledge of the history of mandolin like no one else in the world. I learned many important things from him about technique, repertoire, research and so on. I got from him one basic concept: how important our instrument is! I grew up in a mandolin orchestra, literally, since it was formed at home, where we also had our music school. My father gave (and he still does) a big contribution to the music developing in my city, Savona. As soon as I learned, I had a great training in teaching, since I did it right away, one year after I began studying music. Joseph Brent: What a privilege to grow up surrounded by this music and tradition, and to have such ready access to this instrument! In the United States, it's a bit more difficult to find classical mandolin instruction which leads me nicely to something I definitely wanted to get into. Recently, at the CMSA Convention in Baltimore, you and I took part in a symposium on the future of mandolin education in the United States, and you gave what I thought was a fantastic presentation. Can you briefly summarize again what was discussed there? Carlo Aonzo: I've been coming to the U.S. since 1997, and I started doing my 'spreading' work since then. I come about three times a year doing concerts, joining local mandolin orchestras and giving workshops. I can say that I've met almost everybody in the classical mandolin field in the U.S., and I've seen classical music's steady development. Since 1999, I've been running a mandolin workshop in Manhattan that has inspired many mandolinists and has become a reference point for the classical mandolin. Since the first time I came here, I've seen the level of playing and knowledge grow exponentially. The level of mandolin playing has grown quite a lot thanks to lovers of the instrument that also have reference points with these kinds of events and activities. I'm thinking, for example, of your own personal experience, Joe! Performing Raffaele Calace's Concerto in La minore n°2 Op.144 - III Movimento - Allegro, recorded with Orchestra a Plettro Gino Neri at Teatro Comunale di Ferrara, January 1, 2010. Carlo Aonzo: It's wonderful to see how things can grow and spread, when it is all made from the love and passion I learned from my father and from the knowledge given by Orlandi. So, the European experience can be very useful for the U.S. mandolin development. As you stated, often there aren't good opportunities for mandolin lovers and potential mandolinists to learn the mandolin, especially the classical mandolin. Likewise, mandolin performers and teachers often don't have an 'easy life' when they propose themselves to institutional music schools for teaching mandolin, or to orchestral or music institutions to perform mandolin concerts. This is due to the unfamiliarity about the mandolin we are surrounded by, and because of that, I asked to speak about this topic at the opening of the CMSA Convention. All the lovers of the mandolin that attend the CMSA every year, all together we are a power. A power against this ignorance that can be organized and used for the instrument itself. This will produce more interest in the instrument to all levels: aficionados, students, teachers, performers, musicians, etc. We have great examples of wonderful activities like the youth orientation made by Laura Norris in Baltimore. She is a wonderful reference point for those who are interested in starting a mandolin program to kids in schools. This is just an example; I'm thinking also of Johanna Hebing in Montreal, where (again) with the power of love and passion, things are growing so much. It's the same for Mannes. It's incredible that great artists in the U.S. don't have positions in music schools. I refer always to the history of the guitar. It happened about 40 years ago, and now the guitar is the most popular instrument in all music schools. Joseph Brent: The first guitar program at a conservatory was at Mannes, in fact! Carlo Aonzo: So, this might be the start! We need all music schools, music institutions in general, to be informed about the strong identity of the mandolin, the versatility, everything is important to know for understanding how important it is to have a mandolin program, or concert, or any kind of activity. This message is for directors of the music world. Joseph Brent: It's really wonderful that the branches of that tree are spreading so far. Years ago when I was a babe in the woods I came to you for study, as just about every player of classical mandolin has had to seek out European instruction. This is not the worst thing in the world of course. But as you say, it's also very important that that tree actually spreads here and everywhere, so that the instrument is at the fingertips and in the consciousness of all young students. Carlo Aonzo: That's right. That's culture, and our role is to change it. Photo credit: Seville Media Photography of Milwaukee, WI. Joseph Brent: Can you talk a bit about the workshops you give in the U.S.? When and where will they be held? I know you have one coming up here in New York City. Joseph Brent: And I can attest from personal knowledge, it's something that every serious student or lover the mandolin in America should experience! I tell my students at Mannes, that they can learn more in a few days playing together with other students and guided by you, than they can in a dozen one-on-one lessons with me or any one teacher. Carlo Aonzo: You are very kind Joe. What is important to me is to propagate the identity of the instrument, and of the instrumentalist. I always like to say: "Learn the difference between 'playing classical music with the mandolin' and 'playing classical mandolin.'" It means you have the knowledge of the classical mandolin's own repertoire and history, the names of the past and present important figures of composers and performers, etc. Another great opportunity for a full immersion with music and mandolin is my week-long Accademia in Italy, the last week of August every year. This year it will be in Ferrara again, during a gorgeous busker music festival taking place all over the city for the entire week. My mandolin week gives different mandolin musical genres an opportunity to deepen. Joseph Brent: I've attended the Accademia as well, and it's not only a great educational experience, but you also get to play in the idyllic setting of Northern Italy! Mamma mia, che bello! Group photo from Carlo Aonzo's 2010 International Italian Mandolin Academy in Savona, Italy. Photo credit: Luigi Cerati. Carlo Aonzo: Yes, the setting is always beautiful, merged with the history of the music, and it is a unique opportunity to make international contacts with people with the same interest. I did see many artistic relationships born during the Accademia between students or teachers. Joseph Brent: It's a helluva town! It's clear that you are very passionate about education for our instrument, but of course you first became known for your playing! As you say, your father was a major early influence, as was Ugo Orlandi. What other players influenced you? And, are there any players today that you listen to? Carlo Aonzo: I was very much influenced by America, so, I was greatly influenced by the mandolin art of Jethro Burns and by the virtuosity of Sam Bush, Mike Marshall, David Grisman... I like bluegrass music very much. In the classical music field, I like the works of Manuel Munoz for early music with plucked instruments. As for mandolin quartets, I suggest the virtuosity of Arsnova from Japan. Very impressive! Joseph Brent: Japan is another place, of course, where the root of European mandolin education has grown into many fantastic branches. Carlo Aonzo: Of course the German school has produced great performers, but also many new young great performers are coming out from Russia, Israel... You are pointing to an interesting fact that in Japan they followed very much the original Italian style of mandolin playing. Usually our instrument changes its shape when it meets a new country and its culture. Joseph Brent: That's an interesting point. In the United States, the flatback mandolin is king, whereas in Europe, the various permutations of the bowlback dominates. In Japan, the Italian bowlback is most common. Carlo Aonzo: Japan has more Italian bowlback mandolins than Italy itself! Carlo Aonzo: In Japan they have boutiques for mandolins, rather than just shops. This is something that should be investigated. I lead the attention to researchers like Paul Ruppa in Milwaukee; he is an example of how musicologists should study the history of the mandolin in the U.S.
Joseph Brent: I think the wide variety of mandolin DNA is because the music you play has to come from the voice of the culture that produced it. For example, I'm a product of European musical education, but also the American culture I grew up in. So my voice has to speak from both places, thus the sort of hybrid instrument I perform on. In Israel, where the Kerman-style instrument predominates, this is due to the influence of Israeli and other Middle Eastern music which come from that culture. Carlo Aonzo: This is a good thing, this diversity of the mandolin. You cannot say the same for the violin played in different styles and countries. Joseph Brent: Absolutely true. Homogeneity is something no one could accuse the mandolin world of! Do you have any other musical projects you are working on right now? Carlo Aonzo: An album of Paganini is almost ready. I did it with Rene Izquierdo, guitar teacher at the University of Wisconsin in Milwaukee. Then I'm going to do a recording of Vivaldi mandolin concertos with original instruments in Vienna, with the early music group Il Falcone. Joseph Brent: What modern repertoire do you perform? Carlo Aonzo: I play many different concepts of modern music. I'm working on a project of all new music for mandolin and guitar, mainly featuring pieces that composers have dedicated to me. I play 'modern' mandolin for a larger audience with a band, showing the different styles from which the mandolin was developed around the world (so, from Jethro to Jacob, from a revisited Calace to Nagaoka, etc.) I'm pointing my attention also to the 'modern' music, intended as atonal, but this is something new to me. Joseph Brent: (laughs) It's new to everyone, that's why it's 'modern' music! Carlo Aonzo: You got the joke! Joseph Brent: Thanks so much Carlo, for taking the time to answer some questions. It was really great getting a chance to talk with you, as always! Joseph Brent: Ciao, e a presto! Carlo Aonzo: A presto, ciao! Carlo and his Pandini mandolin performing with The Laboratorio Musicale a Pizzico of Savona, a chamber ensemble of plucked instruments which founded and serves as director. Builder's comment: "I have been constructing mandolins for over 30 years, exclusively according to traditional methods — my instruments are entirely hand made. This mandolin is my Neapolitan model. The back or 'bowl' and the neck are made from Balkan or Eastern European maple wood; this wood has been personally aged by me for 20 years before being used. "The top or soundboard (the most important part of the mandolin) is spruce from the Italian region Val di Fassa that is the best in Paneveggio (just East of the city of Bolzano, near the Swiss border). This is the same region that Antonio Stradivari, in the 17th and 18th centuries, selected his spruce for his prestigious violins. "The process requires a long maturation period that I oversee personally. This is the result of a long and careful study of the sound and acoustics of wood undertaken with the help of great mandolinists like Carlo Aonzo and others, according to their advice, which has allowed me to build mandolins according to their needs. "The varnish on my mandolins is strictly organic substances, of the type used on violins. The whole process is time-consuming but the end result is always great." Instrument/case: I play a Pandini mandolin made in 1994. The case was made in Japan, very light but strong enough for travel. Picks: My usual picks are made from tortoise shell (from old manufacturers), but there are good plastic material picks for training like Galli. Microphone preferences: I found the contact mics made by Shertler very good, and the same for the speaker, or Neumann or AKG. I don't have a personal mic for recording, but I don't start doing a recording if I'm not happy with the sound. another fun filled,feel good interview..inspiring..thanks.. Wonderful stuff -- interview and music. Many thanks! Carlo is not only a great mandolin player, he is also a fine teacher and a strong proponent of our wonderful little instrument. Coincidentally, today (January 24th) happens to be his birthday. Another wonderful interview celebrating an anniversary. This interview with Carlo was put together by Joe Brent and published this date 2012. Fine interview with two very fine players. This is the reason I hang at Mandolin Café. Another feature interview celebrating an anniversary today.